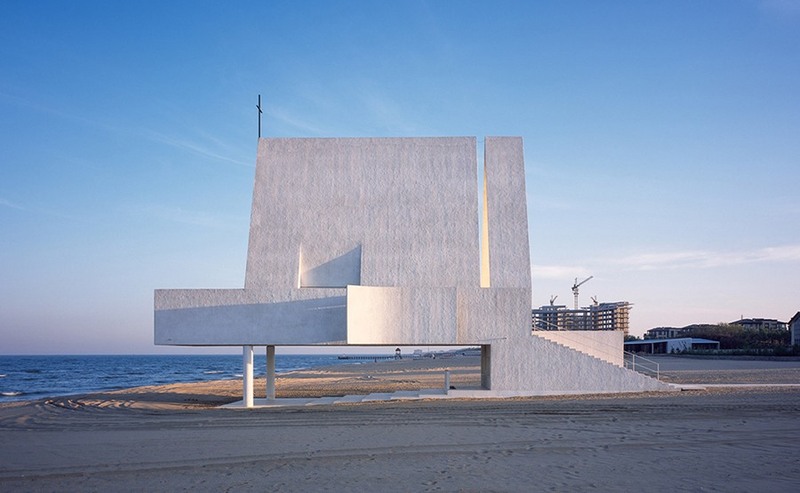 based Vector Architects recently completed a striking seashore chapel designed as a place for worship and community gathering. Inspired by the idea of an ancient boat washed ashore, the stark white structure sits perched on China’s Bohai Sea where, when the tides roll in, it is engulfed until it “floats” like a vessel on water. is divided into two main spaces, the elevated indoor chapel and a covered outdoor chapel which is submerged daily at high tide. grand staircase doubles as an informal gathering space for members of the community. is divided into the central chapel which looks out to the sea, a small meditation area, an office, bathroom and pian mezzanine. within the chapel is carefully choreographed with strategically placed windows that limit the harsh sun while simultaneously filling the space with a diffuse natural glow. Panes of concealed stained-glass add an extra dose of magic as they cast beams of color across the chapel’s walls. the small chapel cuts a statuesque figure against sand, sea and sky.